We all know that our legs are important in the game of golf and to our overall health and fitness. 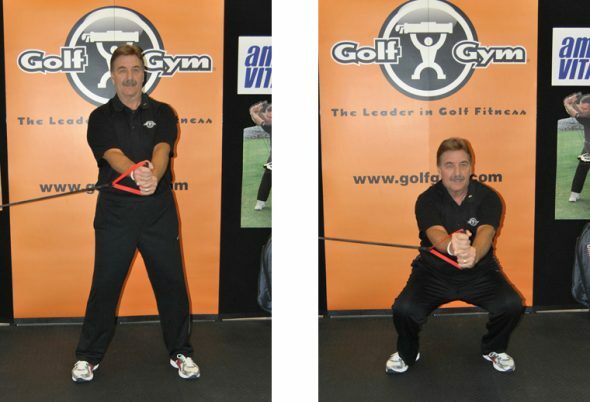 Strong legs keep us stable, help our balance and can help us add more power to our golf swings. Strong legs will also help us get through life a little easier while climbing up and down stairs, getting in and out of chairs, and walking 18 holes, to name just a few. 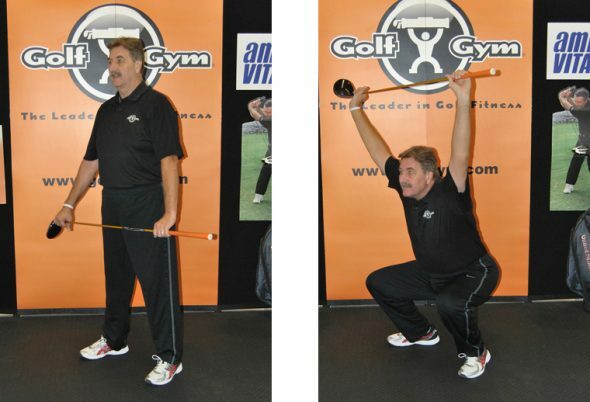 Many PGA and LPGA Touring professionals are now doing Olympic type lifting of weights to develop a stronger lower body and more powerful legs…especially deadlifts and squats. You don’t have to use a lot of weight to get some great benefits. Nearly every time I hear a golf swing instructor talking about “power” in the golf swing, they describe using “the ground” and the legs to generate that power. Squats are an especially great way to involve nearly all the big muscles in your body while performing what it a very simple exercise. Proper form is critical to getting the most out of squats, and will help to prevent injury. 1. When starting out, only go as far down as you can with the confidence to get back up smoothly. 2. Distribute your weight evenly between both legs and feet. Approximately shoulder width apart. 3. As you squat, move your “behind” back and down, keeping your upper body as upright as possible. Don’t curl down over your knees. 4. Establish a very stable stance with your weight spread evenly from your toes to your heels. 5. Flare your feet out slightly as to not put additional pressure on your knees. Everyone’s hips are designed slightly differently. Place your feet in a manner that is comfortable to you with no pain throughout the movement. 6. From the squat position, push down through your heels as you come up…not through the toes. Here are 4 variations of the squat. These are simple (but not easy) body weight movements. Using a balance/fitness ball and a wall is a great way to start. 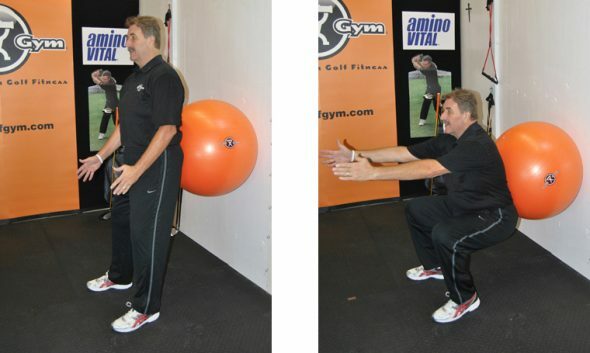 The ball and wall add stability and the movement is isolated to your quadriceps. Start with a slight lean into the ball and push back into the ball as you move down. Push down through your heels and come to standing position. Do as many as you can. Try 3 sets of 10. This one is a simple standing squat. This will require a bit more stability than when using the ball and wall. 3. This squat is used by many trainers as an evaluation of your ability to squat and bring your hands and arms above your head. It is challenging, but it will help to develop a much more stable stance and extension in the upper body. This squat is performed while using resistance from a power band or a weight machine. 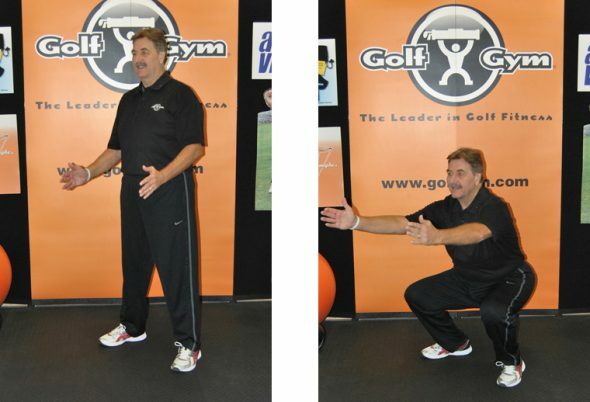 The “anti-rotation” aspect of this squat challenges your stability and balance big time. Create some resistance from the fixed point (either a band or machine) then, with arms out in front of you, squat while keeping tension in the handle. This is very challenging and will work many more muscle groups. Keep your back as straight up as possible. Push down through your heels to come back up and start again. Test out the amount of resistance before doing many reps. It is very important to perform this one from both sides to balance everything out. This last Bonus Challenge should be performed while using the ball and the wall. Bring your hands and arms up above your head while in the squat position. It is best to perform a continuous movement from down in front to above your head as you squat (Similar to the squat using the driver). Perform these movements regularly (twice a week) to get the most benefit. Don’t go crazy on the reps the very first time out. You will feel the effects, including muscle soreness, on the second day. Not the next day, but the second day. So take it easy to start and build up the reps. Your strength, stability and balance will love you for it. 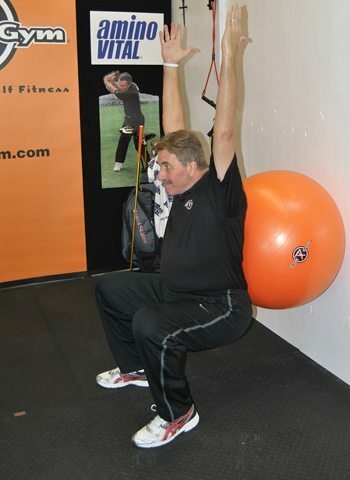 For more great golf training tips go to: www.GolfGym.com/golf-swing-tips-drills. ← Golf Fitness…How Do I Get Started?